I can forgive people for overlooking the fascinating behaviors of the thieving ant Ectatomma ruidum. 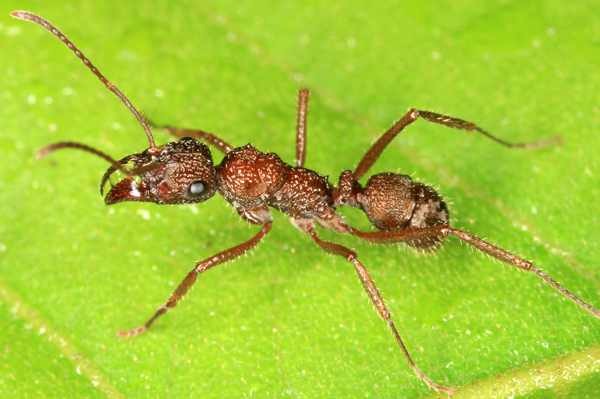 There are so many ants with peculiar and amazing features (like agricultural ants, and those with rampaging armies). Some just fly under the radar. Here’s the latest from my lab. A few decades ago, Mike Breed and his students were studying behavior, and one part of the work involved using baits to feed ants. He noticed that sometimes, when a colony brought a good piece of bait underground, a different ant took it out of the colony, and carried it in a straight line to a neighboring colony. With a set of careful observations, excavations, labeling workers and some nestmate recognition chemistry, he described a unique phenomenon. I wanted to understand how this thieving can persist, with everybody stealing from everyone else. This phenomenon makes a jumble of most game theoretical models, because everyone seems to be cheating, all of the time. What makes thieving happen? If they have plenty of food, do they stop thieving? We ran an experiment in which we gave the colonies as much food as they ever could have wanted. It turns out that the rate of thieving did slow down. The surprising result was that they kept continuing to steal from their neighbors, even when they had everything they could ever want. This raises many more questions about the function, evolution and maintenance of thievery. We’re actively working on that, with some work finished and more in the works, and I’ll share more as it comes out. I’ve long wanted to work on the ecology of thieving, ever since I helped out on a project with these ants. However, I never had the time to set aside. In 2008, a friend of mine had a PhD student who was working on poneromorph ants, who was interested in getting some time in the tropics. I was down in Costa Rica with a group of undergrads at the field station, and Benoit Guénard joined us a few weeks. He was a tremendous influence on my students with his enthusiasm, natural history talent, and the most robust work ethic I’ve ever seen. Seriously. We knocked out this project together, with Benoit taking the lead. This entry was tagged ant science, collaboration, Costa Rica, undergraduate research.